Commute to Rome by train on your own from the port of Civitavecchia and tour Rome by golf cart with us. You can choose between a 4-hour and a 6-hour tour. If you opt for the 4-hour tour, this will have to end at 1:30 pm even if you get to the station late, so you’ll loose some of your tour’s time. Choosing the 4-hour tour you can spend a couple of hours in Rome by yourselves, but you’ll have to get back to the station on your own. If you choose the 6-hour tour we’ll take you back to the station at the end of it. You’ll have to use the port’s free shuttle to go from the ship to the port’s gate and then walk to the station (about half a mile). Please try to board one of the trains that leave around 8/8:30 am, so to be at San Pietro Station around 9/9:30 am. Also please, beware of the fact that if you book the 4-hour tour and you show up late at the station, the tour will still have to end at 1:30 anyway because we’ll have other tours booked for the afternoon that start at 2/2:30 pm. The train’s ticket is less than 10 Euros. The small train station near the Vatican named after St. Peter: “Stazione San Pietro” is the best place for us to meet you. Please do not get off at any other station. We meet at San Pietro Station and the 4-hour golf cart tour starts immediately. The 4-hour golf cart tour will end anywhere you’ll want to end as long as it’s within the golf cart’s range and you’ll be on your own from then on. We meet at San Pietro Station and the 6-hour golf cart tour starts immediately. The 6-hour golf cart tour will end back at San Pietro Station. To those who’ll be in Rome for the first time, we recommend the tour of the major highlights, otherwise, unless you have special requests, you can pick one of the itineraries from our tours’ page here or discuss it with your driver/guide. Commute to Rome by train on your own from the port of Civitavecchia and tour Rome by golf cart and the Vatican with us. At the end of the Vatican tour you’ll be on your own. You’ll have to use the port’s free shuttle to go from the ship to the port’s gate and then walk to the station (about half a mile). Please try to board one of the trains that leave around 8/8:30 am, so to be at San Pietro Station around 9/9:30 am. Please beware of the fact that if you book the 4-hour tour and you show up late at the station, the tour will have to end at 1:30 anyway because we’ll book the Vatican for the 1:30 pm slot. The train’s ticket is less than 10 Euros. The small train station near the Vatican named after St. Peter: “Stazione San Pietro” is the best place for us to meet you. Please do not get off at any other station. We meet at San Pietro Station and the 4-hour golf cart tour starts immediately. During the tour we’ll stop somewhere nice for you to get a bite to eat before spending the afternoon at the Vatican. 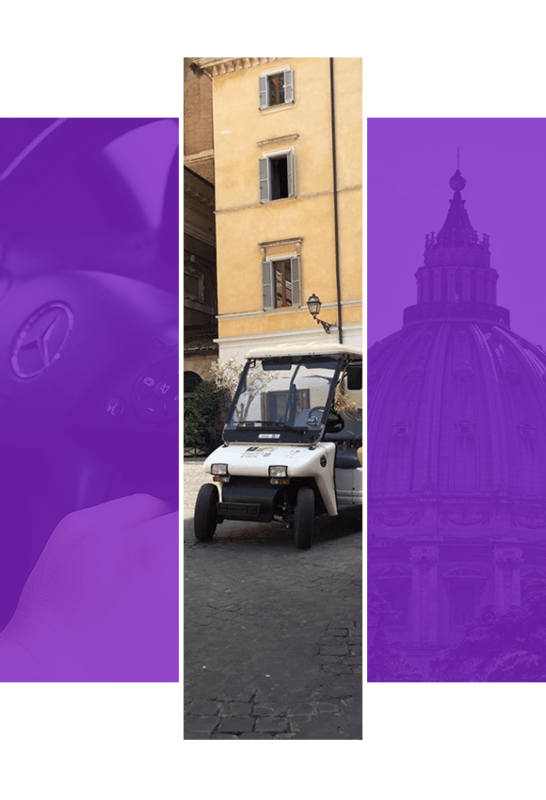 The 4-hour golf cart tour will end at the entrance to the Vatican Museums where you’ll be introduced to the guide who’ll take you on your private walking tour of the Vatican which will include the Vatican Museums, the Sistine Chapel and St. Peter’s Basilica. End of the tour. Your guide will help you take a taxi or show you the way to walk back to the station. Please do not forget that at the end of the Vatican tour, you’ll have to get back to the station on your own. The golf cart tour does not follow a preset itinerary, our policy is to show you as much as possible within the time you allot for your tour with us. To those who’ll be in Rome for the first time, we recommend the tour of the major highlights, otherwise, unless you have special requests, you can pick one of the itineraries from our tours’ page here or discuss it with your driver/guide. To find out how to get from the port of Civitavecchia to Rome by train, please click here. PRICES - "Train + Golf Cart + Vatican"
Prices per group* (4 hour – golf cart tour). Note:*Only tickets’ prices are per person. 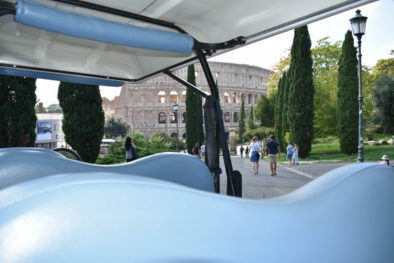 Golf cart tour of Rome and Vatican for cruisers (commute from the port by train not included). We pick you up at the ship, take you to Rome in a private vehicle, show you around Rome in a golf cart and take you back to the port! Let us take care of everything and leave you with nothing to worry about: we’ll meet you right at the pier where you ship docks, and take you back there at the end of your tour. You’ll be driving in a sedan car or minivan depending on your group’s size. Choose between the 4-hour and the 6-hour tour. We’ll meet you right at the pier where you ship docks. Your driver will be standing by your ship’s gangplank posting your name. Arrival in Rome, Piazzale delle Canestre, in the park of Villa Borghese, and starting of your golf cart tour. The 4-hour golf cart tour will end wherever you’ll like it to end (within the golf cart’ range). Before leaving you we’ll set a time and place for you to meet the driver that will take you back to the port. End of the tour at Piazzale delle Canestre, in the park of Villa Borghese where you’ll meet again with the driver who’ll transfer you back to the port. PRICES - "Transfer + Golf Cart"
Prices per group. 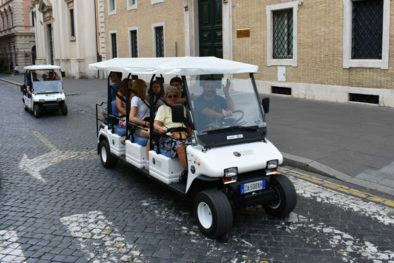 Golf cart tour of Rome for cruisers including private transfers from the port. Rome and Vatican effortlessly! We meet you right at the pier where you ship docks, and take you back there at the end of your tour. This includes round trip transfers in a private vehicle, 4-hour golf cart of Rome a and a private tour of the Vatican with “skip the line” tickets! Let us take care of everything and you’ll have nothing to worry about: we’ll meet you right at the pier where you ship docks, and take you back there at the end of your tour. You’ll be driving in a sedan car or minivan depending on your group’s size. To those who’ll be in Rome for the first time, we recommend the tour of the major highlights, otherwise, unless you have special requests, you can pick one of the itineraries from our tours’ page here or discuss it with your driver/guide. Arrival in Rome, Piazzale delle Canestre, in the park of Villa Borghese, and starting of the 4-hour golf cart tour. During the tour we’ll stop somewhere nice for you to get a bite to eat before spending the afternoon at the Vatican. End of the tour. You’ll meet again with the driver who’ll transfer you back to the port. PRICES - "Private Transfer + Golf Cart + Vatican"
Note: *Only tickets’ prices are per person. 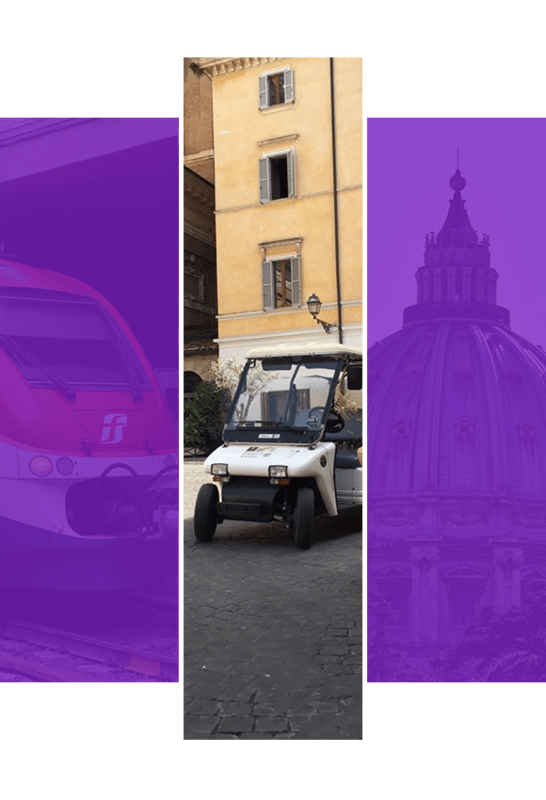 Golf cart tour of Rome and Vatican for cruisers (commute from the port by train not included). NOTE: We reply to our e-mails almost instantly so, if you don’t get our reply to your e-mail within 48 hours, please check your “spam” folder and/or resend your e-mail to another one of our e-mail addresses and/or call us. For short notice/last minute reservations, please do not just send an e-mail, call our emergency number: +39 337 783 255. Check out our alternatives tours also, you'll be surprised! A unique experience on board a golf cart. 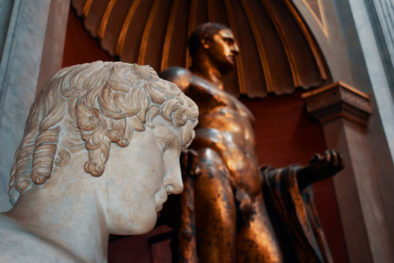 Customize your tour with one of our expert driving guides and envelop yourself in the history and aromas of the Eternal City. Our best-seller, the private tour of the Vatican, includes the Vatican Museums, Sistine Chapel and St. Peter’s Basilica. Our tours are private and therefore they can be customized. Our best-seller, visit with one of our specialized guides the Colosseum, the Roman Forum and the Palatine Hill. Our tours are private and therefore can be customized.